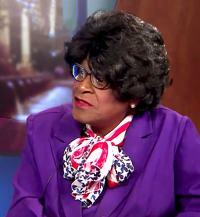 More than 20 years and 20 elections since she last held elected office, perennial candidate Althea Garrison is positioned to return to public office and land a seat on the Boston City Council. As the fifth-place finisher among candidates for the City Council's four at-large seats during the 2017 election, Garrison is in the catbird seat for filling any vacancy among at-large councilors. A vacancy is expected to come later this year as At-Large City Councilor Ayanna Pressley, after defeating Congressman Michael Capuano in Tuesday's Democratic primary, prepares to take office as a congresswoman in January. Reached by phone Wednesday after she had visited City Hall to talk with election officials, Garrison said she campaigned for Pressley and "I knew she was going to win because of the enthusiasm that was out there." She said Pressley's victory was that much sweeter knowing she would be in line to finish Pressley's term on the council. "It means that I will be able to adjust the housing issue, the veterans issue -- too many veterans that are homeless on the street and to me that is a disgrace -- homelessness issues and senior citizens issues," Garrison said. Garrison secured 18,253 votes in the 2017 city council elections, good for fifth place behind councilors Michelle Wu, Pressley, Michael Flaherty and Annissa Essaibi George. Boston's city charter dictates that the city clerk is to notify the council within 21 days of a vacancy and that the council is then within 15 days to choose "whichever of the defeated candidates for the office of city councillor-at-large ... received the highest number of votes" in the last election. During the 2017 campaign Garrison argued that Pressley, among other councilors at-large, "should be defeated and held accountable" for a 2015 vote raising their own pay. Garrison said she thinks she will fit in "very well" on the city council and that a handful of councilors stopped to congratulate her while she was at City Hall on Wednesday morning. "I would probably be the most conservative on the council, but that doesn't bother me at all and I don't think it bothers any of the councilors," she said. "I think I would have an excellent working relationship with them." Garrison, who has run for office as a Democrat, a Republican and as an independent candidate, described her political ideology as "conservative to moderate" and said she is "sort of disgusted with both parties." She is not enrolled with either party. Garrison served one term in the Massachusetts House in the early 1990s as a Republican but lost the seat in the 1994 election to Charlotte Golar Richie by about 400 votes. Garrison has run unsuccessfully for office in all but one state election cycle since 1986 -- her state election record, including primaries, is 8-24 -- and has run for office at the city level each cycle since at least 2005, according to state and city elections results. "No matter how long it takes, the fight goes on and the dream is alive," Garrison wrote in a letter thanking her supporters after a 2003 loss. When she ran for state rep in 2006, Garrison described herself on her campaign website as "one of the most concerned citizen living in Boston, calling the City Hall about 5 times per day and writing so many letters to the editor that some newspapers won't post them anymore!" Garrison is also believed to be the first known transgender member of the Massachusetts House and possibly the first transgender member of any state legislature in the country, though she does not publicly acknowledge her past. Two days after her 1992 win, the Boston Herald printed an article citing Suffolk County Probate Court records showing that Garrison had formerly been a male known as A.C. Garson but was granted a name change in 1976, according to a 2010 recounting published in the Boston Phoenix. With the seat on the City Council, Garrison would also be entitled to the annual councilor salary of $99,500. "Even though I haven't been in office since 1993-94, I still do the work of a constituent services person and I don't get paid for it," she said. "At least when I do the work, I will get paid for it." Though the seat on the City Council appears to be Garrison's to fill, she could already have another job by the time Pressley officially resigns: the unenrolled Garrison will face Democrat Liz Miranda in November's general election to fill the seat Rep. Evandro Carvalho gave up in his unsuccessful run for Suffolk district attorney.